Happy 4th of July, I mean, Oktoberfest! 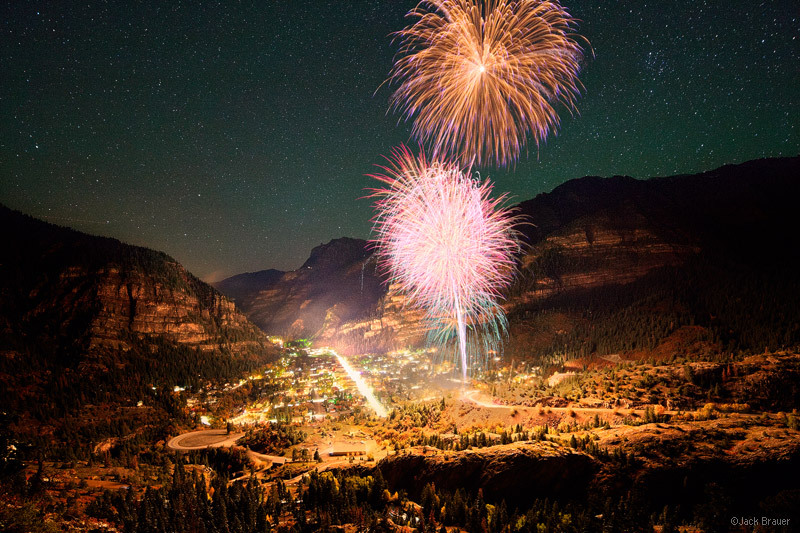 Just like last year, Ouray had leftover fireworks since the 4th of July show was cancelled due to fire danger, so they shot them off for the Oktoberfest party instead. I’ve said it before and I’ll say it again: there is no place like Ouray to watch (or listen to) fireworks! The booming echoes that reverberate around the mountain walls are incomparable. Compare this photo with my shot of the fireworks last year, taken from the same perspective but much, much higher up! Posted in Colorado and tagged Colorado, San Juans on October 6, 2013 October 18, 2013 by Jack Brauer. ← Previous: "Autumn Colors in Ouray"
Beautiful picture Jack. Sure would like to have been there for the celebration and to par take in a few adult beverages for the event. Hi Nick, this is actually a composite of about 4 or 5 images shot from the same composition and tripod position during the fireworks show. The base of the image are two long, high ISO exposures – one normal one with no fireworks (for the town lights and center of the image), and one super bright overexposed one taken during the fireworks (which was used for the illumination of the surrounding landscape). After those were blended, I overlaid 2 or 3 individual normal fireworks shots using “lighten” blend mode. Yes it was a lot of work but it ended up pretty close to how it looked in person! ?